This chapter will continue to map the progression of international PRR consequent to the Rome Convention and TRIPS agreement and its diffusion at national level. In that regard, the chapter will discuss the way in which PRR was further expanded internationally through the WIPO’s WPPT and the Beijing Treaty and the way in which it was transplanted in the Sri Lankan context. As will be alluded to, the PRR is predicated upon a creative hierarchy, which is different to the one characterising the Sri Lankan music industry, an interesting characteristic that will be discussed later on in this book. 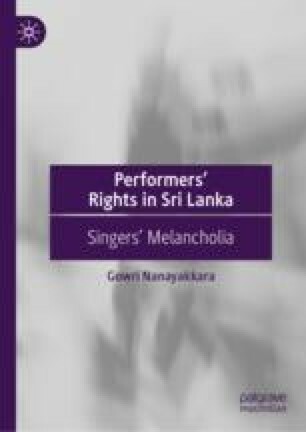 The foundation laid in here for such discussion is helpful in understanding whether the PRR is effective in addressing the concerns of the Sri Lankan vocalists. Parts of this chapter were included in an earlier publication, published as, G Nanayakkara, ‘Mimesis, Cover Versions and the Commercial Vocalists’ Dilemma; Sri Lankan Perspective’ (2012) 1 International Conference on Asian Studies: Official Conference Proceedings 461–474. Bennett M Lincoff, ‘Worldwide Music Performance Rights: The Devil in the Details’ http://www.filmmusicmag.com/?p=615. NISO, ‘A Framework of Guidance for Building Good Digital Collections’ https://www.niso.org/sites/default/files/2017-08/framework3.pdf.